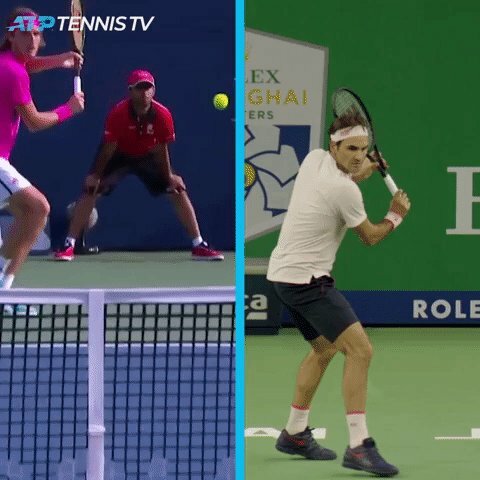 Tennis TV's tweet - "All set for a single-handed showdown! ✨ Federer or Tsitsipas - who you backing? #AusOpen "
Federer or Tsitsipas - who you backing? Ese gif es pornográfico. ¿Nadie piensa en los niños? Roger hopefully. 21 and 100 titles in one would be nice. Roger all the way, always! Tsitsipas will be a strong contender but I think Roger will prevail! Fed in 5. This is gonna be a good match. Fed in a major...very hard to win against a 🐐. Time for the old guard to move on. Vous croyez que si je regarde ce gif en boucle pendant une demi-heure, je pourrais avoir la moitié de leur style en revers ? This is another possible rivalry that will be very good!